''Oh?'' He rose an eyebrow at Mori with a smirk. Leaning his head foreward towards Mori. He was taunting Mori slightly. Mori flinches and he blinks, leaning backwards. "...Can i help you with something?..." Kirin chuckled and lightly flicks Mori's hair and stood up. Kirin looked down at Mori, without moving his head. 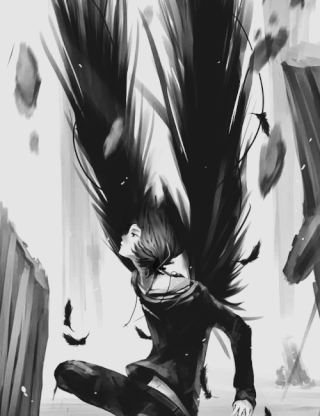 ''Come on..'' He said offering his hand down to Mori to offer him help to get up. Mori blinks and hesitantly takes his hand and stands up. "So...Where do you want to go first?" Kirin helps the boy to get up easily. Yet His hand went limp as if waiting for Mori to let go of him yet doesn't say anything about it. ''Well I'm hungry..'' He smiles almost innocently. Mori notices his hand go limp and lets go, not wanting Kirin to get the wrong idea as he looks to the ground almost stubbornly. "Alright then, there's a food place not to far away." He smirks as he stares at the ground. "Should I lead or should I follow?" ''hm.. I think I can find it..'' He nods his head into the direction the should be heading and started walking in that direction too. 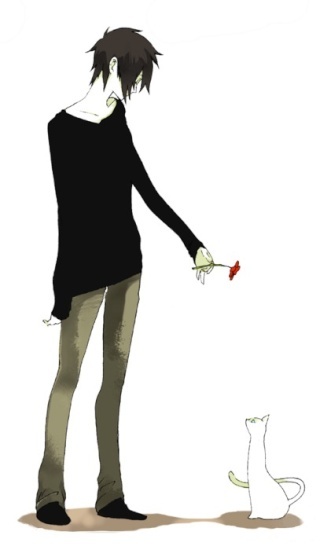 Yet he frowns seeing Mori, not looking at him but at the ground. ''I'm sure the ground in incredibly interesting but I'm not the ground.'' He said calmly. Mori sweatdrops and follows him then tilts his head at him. "Sorry. Eye contact means your listening right?" He smiles again then covers his mouth like before but pretends to be rubbing his nose. ''No. It's impolite, the way you act.'' He says still walking not turning his head but looking at Mori. That was all he said and carried on walking. Mori opens his mouth to say aomething but he thinks better of it and just follows him. Kirin couldn't help but chuckle, he turned many corners along the streets til he came to a still open Ramen Shop. ''I prefer Dangos, Myself..'' His eyes went to the closed Dango shop then back to the Ramen. ''But- Ramen Is all that is open..'' Without waiting for Mori, Kirin kept walking forward. Mori blinks and looks up to the shop and he glances at Kirin then back to the shop, thinking about the ingredients and recipe for dangos. "Maybe the ramen place has Dango's too, you never know?" Kirin chuckled. ''Thats like getting chinese food, from a supermarket instead of the local chinese. It tastes different. The original is always better.'' Kirin spoke as he kept walking to the Ramen shop and pulled back the curtain and holded it up allowing his follower Mori to fall him. Mori follows him inside, looking curiously to the curtain before looking around the shop. Kirin lets go off the curtain, letting it fall back into it's original hanging place. Kirin smiled at the old man behind the counter. The mans eyes showed a flicker of familiarity with Kirin as if he's survived him before, in fact over the last three days the man has always served him. ''Pork Ramen Please Owner-san.'' He smiled politely and sat down. Yet tilts his head in Mori's direction. ''Would you like anything to eat, Mori?'' He asked politely. Mori blinks as his name is called and he turns back to Kirin, having been looking around at the shop. Kirin sighed and turned to the old man and nodded. The old man was wrinkled though ages, He is human. Funny enough Kirin knew if he was a human he was good as dead, when he was 12 years old. He looks up to the plastic and wooden clock that hung on the wall too. Reading off the time. The interiors was more passed of a wooden cavan then anything a few pits of plastic here and there but it held a friendly atmosphere. Mori stuffs his hands in his jacket pockets and glances to Kirin before going off to take a seat at a nearby table. Kirin frowned slightly even though he didn't see he could tell the boy was sitting far from him. Kirin crossed his arms on the table his right elbow against it as his hand made a soft fist and rests his head against it he shighed. Finally he closed his eyes. ''He not going to survive it at your table you kno. 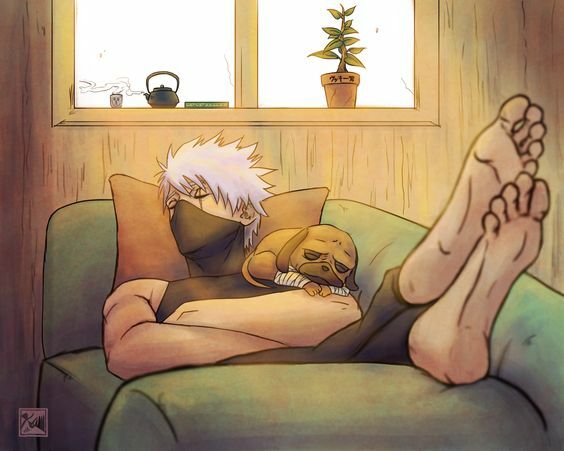 Owner-san is an old human his bones can only do so much work..'' He said lazily. Mori blinks and he looks to Kirin and sighs, getting up. "Fine, where should I sit then? Or should I sit at all?" Mori sits beside Kirin with a silent sigh as he layed his chin down on his crossed arms on the table. His ears twitch as he takes notice of Kirin calling him '-chan' then slump in an almost sulking manner. "Is that a bad thing?...." Kirin laughed slightly at Mori's manner of taking his -chan. His hand rests on the boys head yet rubs his ears gently. ''Such a sulky boy.'' He smirked at Mori. ''Prehapes the little boy needs a nap time.'' Kirin's smirk turned into a taunting one. Mori closes his eyes as he's petted and he pouts at the taunting sound in Kirin's voice. "Hmph. Well, I may be part cat but I haven't slept for a while so I guess so." ''oh?'' Kirin raised an eyebrow continued to gently rub Mori's ear. ''And why is that hmm?'' He questioned the younger. Not taunting anymore but curios. Mori leans into Kirin's hand and he sighs. "My brother often has me out taking pictures of weird places so he can research them for his second job."